An Interview with Mr. Waqar Mehdi,Advisor to Chief Minister Information,Govt. of Sindh. Q. What is the role of the advisor to Chief Minister in this age of digital media? It is the time of Modern Technology and Computers. You can say that now media is on a fast track system. Introduction of new and advanced technologies have brought a great revolution in the digital world. As an advisor to Chief Minister Information, I keep myself updated with all the news and updates. Besides other means, I also try to utilize the digital means to stay connected with media and people and to understand their problems. The main thing is whatever type of media it is, if a person is determined, hardworking, he can perform his duties in a best way by any means. Q. What are the challenges that you face as an advisor to Chief Minister Sindh? By the grace of Allah, I don’t really have to face any tough challenges as I have a better understanding and knowhow with people. 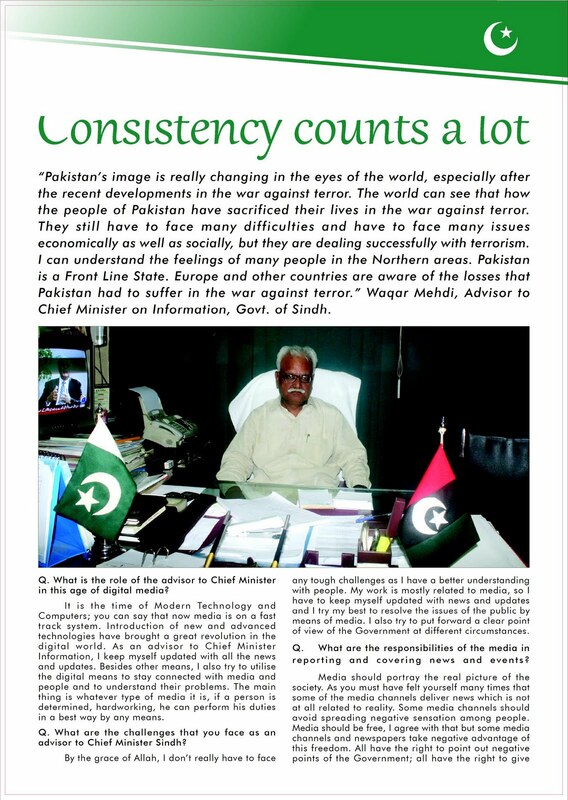 My work is mostly related to media, so I have to keep myself updated with news and updates and I try my best to resolve the issues of the public by means of media. I also try to put forward a clear point of view of the Government at different circumstances. Q. What are the responsibilities of the media in reporting and covering news and events? Media should portray the real picture of the society. As you must have felt yourself that, many times some of the media channels deliver news which is not at all related to the reality. Some media channels should avoid spreading negative sensation among people. Media should be free and I agree with that but, some media channels and newspapers take negative advantage of this freedom. All have the right to point out negative points of the Government; all have the right to give suggestions. Government is always here to hear and correct its mistakes but, what some of the media channels do is to just create negative sensation and false impact. This is very wrong and hurting. Such actions have made people the victim of tension and worries. Let’s take an example of a common working or businessman, I have noticed that many times some of the media channels deliver news with much negative exposure, the man who is necessarily out for his work is forced to leave his work by his relatives and asked to come back as soon. I am sorry to say that some of the media channels become too much exaggerative while delivering news. However, some channels and newspapers are giving a fair and true performance. There should be a fair and just media in the country. Q. What is the Government’s role in the development of a fair and just media in the country? Government is always ready to provide every kind of help to media. In the previous days, we were being told by the owners of the newspapers that GST is being applied. We took actions to withdraw it after they shared their issues with us. Government always gives full support and facilities to Media and Journalism. Government wants the freedom of media and Government has even cooperated with media during different circumstances. Media should use this freedom with justice and should play a fair character. Q. How is Pakistan’s image changing in the eyes of the world after the recent developments in the war against terror? Pakistan’s image is really changing in the eyes of the world, especially after the recent developments in the war against terror. The world can see that how the people of Pakistanis have sacrificed their lives in the war against terror in their country. They still have to face many difficulties and have to face many issues economically as well as socially but, they are fully cooperating against terrorism. I can understand the feelings of many people in the Northern areas. Pakistan is a Front Line State. Europe and other countries understand that Pakistan had to suffer a big loss in the war against terror. Q. How do you assess the current law and order situation in the province? What measures in your opinion should be done by the government to control this situation? The current law and order situation in the province has got better.Specially, we, with the help of police have taken control over the kidnappings on high way. Government is fighting hard against the target killings and crimes in the province. Government is taking strict security and other measures. Government always tries its level best to fight against terrorists and criminals. For that we also want the support of people. These people are in our boundary and only with people’s support and cooperation we can make the situation better. Q. According to you, what steps should be taken to control the continuous target killings in Karachi? Target killings can only be controlled with awareness and cooperation. Government is trying its level best; we want full support and cooperation of people in this regard. Q. What tools do you apply to keep appropriate checks and balances on the media in the country? Government can only request the certain owners of each media channels and newspapers to be fair in delivering news and information. We don’t really want to put checks, because then we are being blamed for being an obstacle for the freedom of media and journalism. Media shouldn’t just portray the negative image of the Government. Media should itself be fair in using the freedom of media. Q. Being a busy person, how do you manage your daily routine? I am a person with consistent nature. A person with consistent nature is always able to manage everything. I believe that if a person possesses the quality of determination then he can manage everything in life, no matter how busy he is. I read newspaper in the morning, and then I come to office bit late in morning as I stay back in office bit late at night. I prefer to spend at least an hour with my family after I come back home. In the evening, if I have to attend any social gathering, I attend that. I never mix my professional and political life with my family and private life. Q. What message would you like to give our readers? I want to give this message that if this society will be educated then there will be lesser problems and lesser crimes. Everyone should give priority to education. Parents should concentrate on their children’s education as education plays a main role in defending a child from the negative effects of the society. People should learn to be patient to bring peace in the city. One should follow the right media and should cooperate in fulfilling the dream which Shaheed Muhtarma Benazir Bhutto have seen for Pakistan. Gold jewellery of Pakistan is famous for its wide variety of styles, designs and neat hand work. Gold has always held a magical fascination. 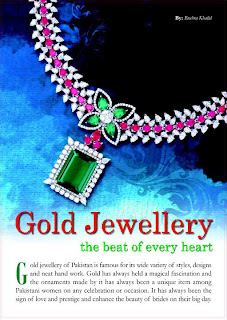 Gold jewellery has always been a unique item among Pakistani women on any celebration or occasion. It holds a great role in bridal getup. It has always been the sign of love and prestige. As far as the subcontinent is concerned, the jewellery dates back to 3000-4000 BC. Excavations were processed in the towns of Ancient Indus Valley Civilization. These excavations revealed that the goldsmiths of such a primal age knew the art of making moulds for metal and terra-cotta ornaments. They made various jewels like necklaces, bangles, earrings, rings, brooches, head ornaments, bracelets, girdles etc. However, the Aryans were fond of gold ornaments, and the Yajurveda testified that gold had magical powers. Women of the Indian sub-continent have always been observed as the biggest buyers of Gold jewelleries. From time to time and with the settlement of Pakistanis abroad, the export of Gold jewellery has also gone up considerably. 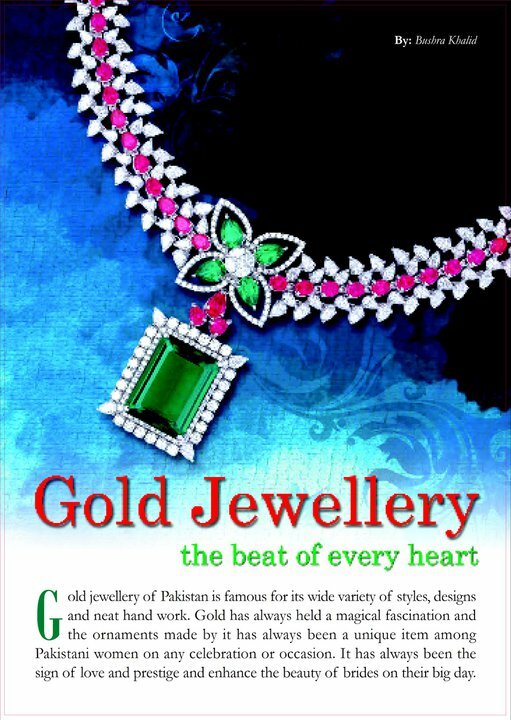 Besides that, entries of Pakistani exporters in some of the developed markets has also supported and promoted the local jewelers to introduce their branded jewellery. Pakistan is among the top consumers of gold. Although its price range has become very high these days but, its demand is always high. Those who can still afford it leave no chance in buying the best of Gold jewelleries. Most of the women like to wear Gold jewelleries, depending on the nature of their work and life-style. The styles of gold jewelleries vary to a greater extent in Pakistan. The styles which are usually displayed in different kinds of portfolios are for both casual and formal wear. Some of these styles are observed to be blended with western styles to create elegant combination of gold and stones for bridal jewelry and casual wear. According to a designer, stones and gems of various colors are embedded in yellow gold or white gold to produce jewellery. This is done in order to match clothes of different colors. These stones can be garnets, topaz, and blue sapphire. This has ultimately given a wide choice to brides for selecting color of their wedding dress and giving rise to new trends. In Pakistan bulk of the jewellery is produced manually using the expertise of skilled workers. Many of these workers are also engaged with popular brands that create ideas regarding the designs of Gold sets and individual items. Ar-Raheem jewelers has been able to create a popular identity in the world of Gold jewellery in Pakistan. It is the leading and an incomparable producer of branded jewellery in Pakistan. It was established in 1986 with and experience of about five decades. Because of a better understanding of customers’ taste, skills of the craftsmen as well as commitment to exclusivity, Ar-Raheem jewelers has been able to earn its reputation in just few years. After getting the significant response from Pakistan, they have increased their business in a successful way. They have customers on both national as well as international level. Ar-Raheem jewelers have always received a good and a satisfactory response from the customers. According to Syed Amir Ali, to get the best result one should understand the personality and taste of the customer. According to a customer of Ar-Raheem jewelers, besides silver jewellery, the designers of Ar-Raheem jewelers understand that gold jewellery sets of wedding are the most significant identity of jewelleries a customer can ever own. Thus their sets are full of creativity and sophistication. Jewelers have a very strong belief that the gold jewellery export from Pakistan can be increased in various ways. They believe that the gold and other jewellery sector keeps the potential to earn even higher export. It all depends on the financial situation and policy of the Government. The Bureau is following a multilane policy. This includes suggestions and recommendations to the government to make essential changes in the policies of the Government. The Bureau is persuading cluster development philosophy in an active manner .Besides that, efforts are being made to make sure that a greater contribution of local jewellery manufacturers in international jeweler exhibitions. If marriage is a dream, jewellery adds existence and reality to this fantasy. Precious stones, gems and set in gold, add a shine to the bride's personality. No wedding ceremony in Pakistan is complete without gold jewelleries. It has become a traditional for a typical bride to wear at least one set of gold. Gold jewellery in any fashion is always a source of magnetism for Pakistani women combining idealism and style. Gold jewellery is all about feelings and desire, which captures the sensuality as well as essence of the woman. Sense of movement and flow in design and craftsmanship is in these days. With jeweler outlets displaying the most modern and stunning wedding sets, gold jewellery is capturing everyone’s heart with full beat. One can also observe the presence of sets in stylish and striking boxes, making the designer gold jewellery as the perfect gift.